It’s that time of year! Time for another My Favorite Things Giveaway! Please note: all bloggers have provided their own prizes, like we do each year. Although this is NOT a sponsored post in any way, I did use Amazon affiliate links to link to the products I’ve included. I love participating in this annual blogger tradition. It’s a FUN way for us to say THANK YOU and Happy Holidays to our favorite readers! * Take a look at the gift collage to see all the amazing giveaways you are about to enter! * Scroll down to see my giveaway up close. 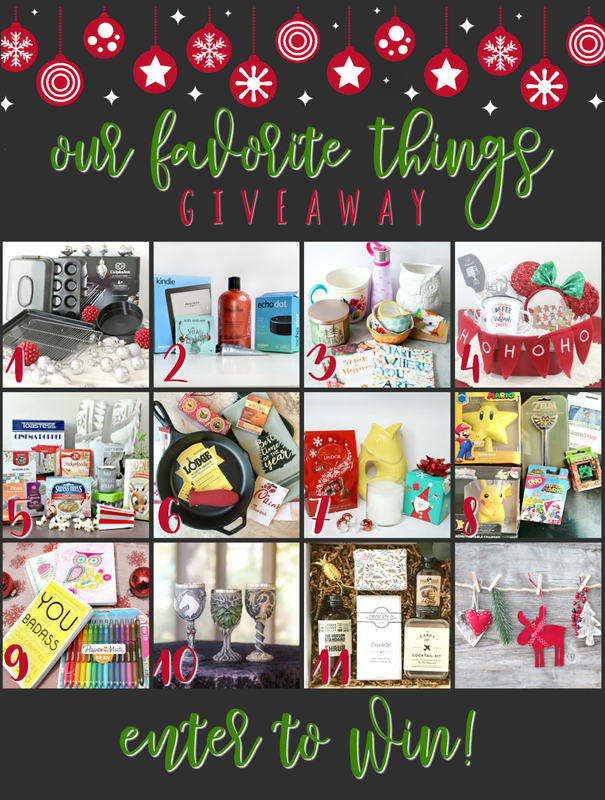 * Enter to win My Favorite Things prize package at the bottom of this post. * HOP around to all the other sites, check out their amazing prizes, and enter to win their gifts! 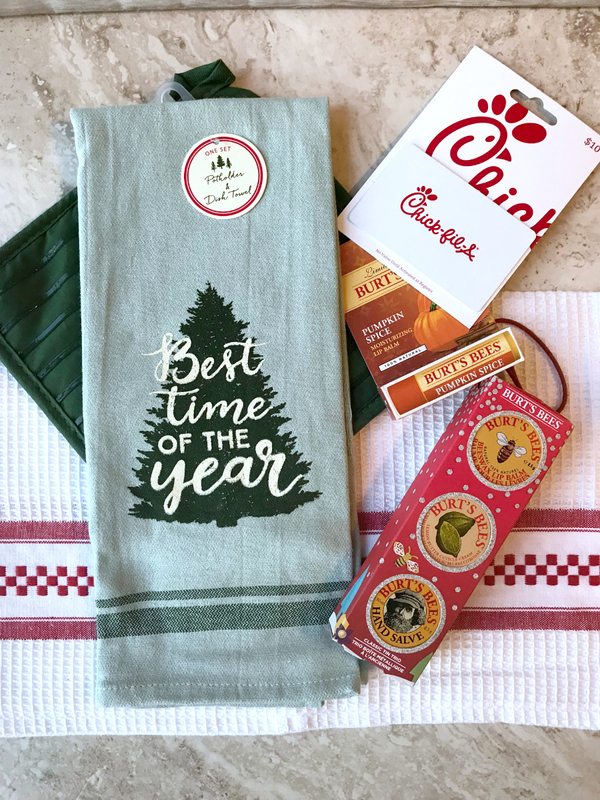 And now for MY Favorite Things Giveaway, an annual tradition here at Food Fun Family! I had so much fun shopping for these items. In the past, I’ve tried to put together a “themed” package, but nothing was clicking with me until I was able to fill my cart with this assorted collection of items. They really ARE some of my favorite things! After you’ve entered my giveaway below, please make sure to go up and visit the other giveaways above! All of these giveaways end at 11:59pm ET on December 10, 2017. We’ll each be picking winners for our individual prizes and notifying winners via email. Good luck! The best gifts have been experiences and trips! The best gift I ever received was a painting of my favorite singer Tom Petty that my daughter created. She is so talented and i’m blessed that she shares her talent with me. I was gIven a trip to Vegas for one bday! The best gift I ever received was a fun getaway trip from my husband! The best gift that I ever received was a ring that says “MOM” on it. The best gift I received was a green Schwinn Stingray bike for Xmas when I was in the 2nd grade ! Last year I received a new laptop computer and I love entering contests with it. Thanks for having this one! The best Christmas gift I ever received was a baby doll when I was 5 from my parents that played lullabies. I still have her 35+ years but she no longer plays music. Best gift….hug coupons! It has become a great joke in our family and I still receive them from my grown children. The best gift I have ever received is my sweet baby grandson. He is truly a blessing. When my Mom took me to Vegas for my birthday for the first time ever! One year my husband took my wedding band to get it cleaned and resized for me. At Christmas, he gave it back…but had replaced the diamond with a new one 3x as big. It was so pretty and sparkly. What a wonderful surprise! The best gift I ever received was a ring of my kids’ birthstones. My Mom got me a laptop one year. It was the best gift I ever got! My favorite gift was a lighted makeup mirror from my son. He was only 9 at the time and used all of his saved allowance to buy it. The best gift I have received is a handprint ornament from each of my children. I got Baltimore Ravens tickets to see them play on Christmas Day. One of the best gifts I’ve received was my iphone after years of using a cheap, old phone. It’s life changing! My best Christmas gift was the birth of my daughter, who was born near Christmas. The best gift I’ve ever recieved is a surprise trip to go see my dear friend battling cancer for the 4th time! She’s still fighting. Hoping for another trip soon! I like my telescope I got for Christmas gift. The best gift I ever received was a gift card at the spa! My husband put enough on it so I could use it a few times throughout the year to get a facial or massage. Loved it! A puppy best gift ever. When I was 10, I received the very first edition of Barbie!. The best gift was the year we went to Disney as a present. The best gift was diamond earrings from my husband. My best gift was probably the bike I got for Christmas when I was seven. The best gifts I ever received are all the handmade gifts my kids made me when they were little. I commented on the CHRISTMAS BRUNCH RECIPES – DELICIOUS DISHES RECIPE PARTY #96 post. The best gift I ever received was an airplane ticket to fly to see my BFF. I loved when I got my first cell phone for Christmas. I was super excited about that, was not expecting it. The best gift I ever received was a boyfriend 27 years ago. PS. I married him! My best gift was when my Granddaughter was born 2 days before Christmas. My all time favorite gift was a dog I got when I was 8 years old. The best gift I ever received were my twin sons very close to my 33rd birthday. The best gift I ever received was my engagement ring. The best gift I ever received? The gift of life! Honestly, I think the year I found out about 11 days before Christmas I was pregnant was my best gift ever! The best gift I ever got was CA$H! The best gift ring I received was a nice ring. I should have kept it! My best gift was my iPad. The best gifts I’ve received are the handmade ones from my kids. I’ve kept them all. I commented on ” DIY Shea Butter Lotion Bars”. My favorite gift was the year I got a bicycle. A few years ago, my mother gave me several of my grandmothers’ rings for Christmas. It special for me to be able to wear my grandmother’s anniversary ring and remember how special she was to us. My husbund bought me a Bunn coffee pot that makes a pot in 2 or 3 mins. I love it. The best gift was an Alaskan cruise. The best gift \I ever received was the Mom necklace from my children. The best gift I ever received was a handmade quilt from my grandmother. My cat.Kind of more a hand me down disguised as a gift (long story!) but he acts like a dog and is the best cuddler in the world. He’s turned me into a cat-lady (I was already crazy to begin with!!). I commented on “Christmas Brunch Recipes – Delicious Dishes Recipe Party #96”. The best gift I’ve ever received was the car my dad got me when I was 16!! One of the greatest gifts I have ever received was a teapot my mom gave me. It is decorated in flowers, so pretty! The best gift I have ever received was from my siblings when they got together to get me a gift certificate from a local animal rescue shelter, where I was able to adopt my new best friend. The best gift I have ever received was the necklace my husband bought me a few years ago. I can’t remember what it’s called, but it’s shaped like a heart, and there is a diamond inside of it, that looks like it beats with every beat of my heart. I absolutely LOVE it! Best gift I ever got was a wedding set that I love! My best gift was sapphire and diamond earrings. The best gift I ever got was a trip to Europe for my sons wedding. The best gift I received was my little dog Jimmy. My best present was a little kitten I got from my parents when I was 6 years old. Best gift was a laptop! Best gift I’ve ever received was a laptop that my boyfriend gave to me last Christmas! My best present was a puppy. The best gift I’ve ever received is my son. I had two miscarriages, and 8 years went by, and then I got pregnant, and carried my son to birth. I’m thankful that we have him every day. The best gift I ever received was an electric blanket because I am always cold. I have been through a few of them since that gift from my parents when I was a teen. The best gift I ever received was a day at the spa! It had a little bit of everything included…even a snack! The best gift I got was a new computer. When I was a kid and sick with the flu, my dad brought me home a gift from a fancy toy store. It was a long-haired furry dog with a comb.It was packaged in a beautiful box with a big bow. I still remember every detail of it 30 years later. The best gift I received is a bicycle. I live on the east coast, and had gone on a work trip to San Diego and while there used a bike to ride up and down the beach. It had been years since I’d ridden a bike, and it just brought back all those young fun memories. I told my husband about it over the phone, and he must have heard the joy in my voice because when I returned home, he had purchased a bicycle for me! It was waiting in the living room with a big bow on it. He bought himself a bike,too, so we could ride around the city together. 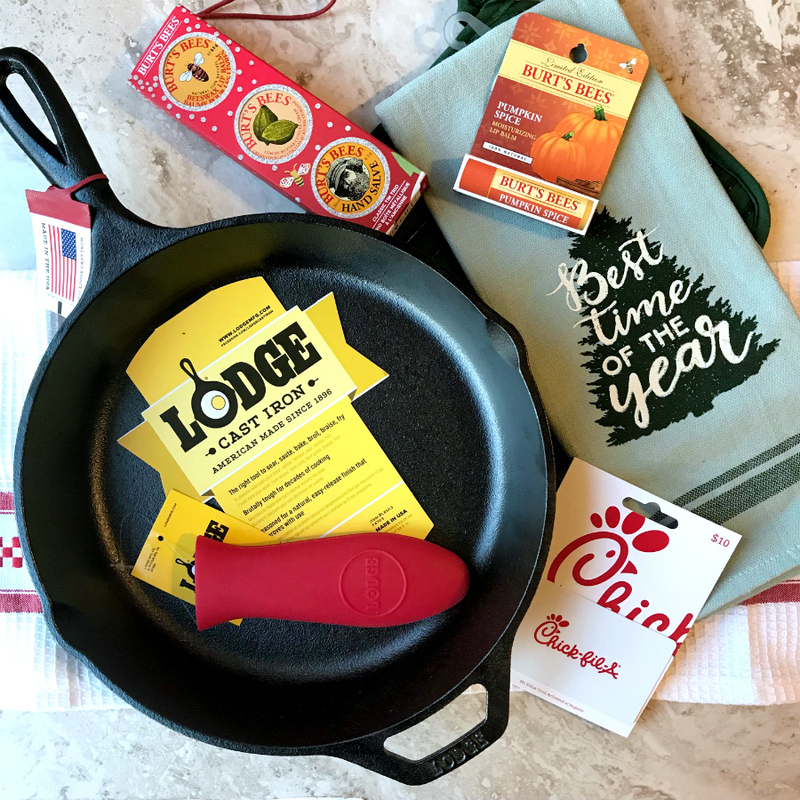 It was such a thoughtful gift, especially since not only did my husband want to recreate the fun I had on my trip without him, but also wanted to participate to make more fun memories together. Aside from my 3 children the best gift I have ever received would have to be my engagement ring. The best gift I ever got was a coupon book from my son, who was 10 at the time. It had coupons for making dinner, doing dishes, etc. The best gift I ever got was when my son who has been deployed surprised me and walked in on our Christmas eve family dinner. The best gift I received was an ornament made by my best friend with a picture of us when we were in high school. She died the following April, so it ended up being the last Xmas gift from her, making it all the more special. My best gift was my daughter – she was an early Christmas present but she wasn’t supposed to be born until the 2 week in December but came mid November! She just turned 10! The best gift I’ve received was a combination Christmas/birthday/Mother’s Day (for the next 5 yrs.) of a Rolex watch. A family friend had a jewelry store and my MIL talked my husband into getting me one, if she got one for herself and luckily it was 1/2 price. The best gift I’ve ever received is a special piece of jewelry from a family member. The opportunity to work in a field that I’m passionate about. My best gift was diamond earrings from my husband. The best gift I ever got was my daughter! The best gift I received was a beautiful necklace that my husband had designed & had made for me. I think when we worked hard to buy our house, right after Christmas. I still remember how excited I was to get the yellow Sony boombox when I was in middle school! Everybody had Sony stuff – I was ecstatic!! The best gift I ever received was a car from my grandma, it gets me around safe, lets me visit home and its a cute red convertible, I mean YEAH! Getting engaged on Christmas Eve was definitely the best gift ever! The best gift ever are the ones that my kids make and give to me. A scarf that was hand knitted by my daughter, a seashell picture frame with my sons picture in it, A drawing my son did of my husbands and I wedding picture, etc. etc. A handmade set of bracelets from my hubby. Best gift has been my two boys! My Instant Pot was my best gift! My husband bought me a new computer last year for Christmas. Our old one had died and I didn’t think that he was going to get me the one that I really wanted and I had talked myself into being okay with it and then on Christmas morning I was totally surprised. He did so well keeping it secret. My best gift ever was a BIG homemade stuffed hippo my sister made me when I was six or seven. Henrietta slept on my bed until well after my college years, until she fell apart because the fabric disintegrated. The best gift I ever got was a desk, when I was a kid. The best gift I received was a trip to a state I’d never been to, but had always wanted to visit. I received a beautiful necklace from my husband several years back after a particularly tough year. I think about what I came through every time I wear it. The best gift I ever received was my late grandmother’s wedding ring. It is black opal and beautiful. I wear it when I need strength. One of the best gifts I’ve ever received is a Mother’s Ring with the birth stones of my three kids. Thanks. The best gift I have ever received was a trip to Disneyland. The best gift I ever received was a puppy! Thank you for the chance to win! 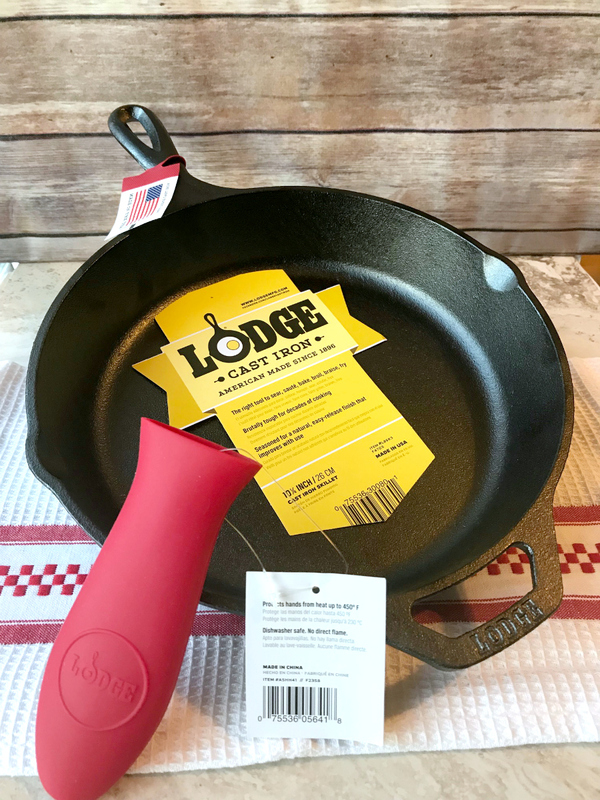 Ooooh, I love a good cast iron skillet as well! I received an Emerald ring in honor of my Nana’s life. She passed away last year and I miss her more than anything in this world! The best gifts I I ever received was my three wonderful children. Thank you for this fabulous chance! A camera has been my favorite present. The best gift I ever received was our cat, Duchess. I received a ring that had my son’s birthstone , after he had just passed away. I received a really special personalized bear. I commented on the delicious post “Favorite Christmas Cookie Recipes – Delicious Dishes Recipe Party #95”. The best gift that I have ever received was a new car from my Dad! The best gift I ever received was a beautiful heart necklace. An engagement ring on Christmas Eve was the best gift. A trip to Diney World. The best gift is the gifts my children made me when they were little. The best gift I ever received was my daughter. She was born right before Christmas. The best gift I received was a tv. The best gift I ever received was my son, born on Christmas Eve. I best gift I ever received was a metorite. The best Christmas gift I’ve ever received was my daughter, who was born almost two weeks before Christmas. My Chloe Pearl was born one week before Christmas on December 18th and she is definitely the best gift ever. Nothing can top that! My best gift was an unexpected really nice ring. The best gift for me was way back when Cabbage Patch Kids were in style and there were blonde headed twins on the couch for me. I thought that was the coolest and had to show everyone. They are still in their box. A homemade baby blanket from my sister. My best gift was my phone! Thank you for the chance to win! My best gift is my necklace that the kids picked out themselves. the best gift I received would be the year we took a family trip… the gift of memories. We all got together and spent 10 days in a cabin in the mountains! My husband once surprised me with a trip to Mexico! My favorite Gift I have ever received is my healthy baby boy. I guess that might sound Chessy to some but there is no wrapped present that will even top the gift of life! The best gift I ever received was a purple mixer from my daughter. She saved up a long time to get it for me. My favorite gift I have recieved was my engagement ring! It was a birthday gift though, not a holiday one! The best Christmas present I ever received was a beautiful red bicycle. My best gift was a pair of Iron Fist shoes from my husband. I love them. My favorite gift was a porcelain bowl that my son made for me. He was 6 at the time. The best gift I’ve ever received is a diamond wedding anniversary ring from my husband. I once received a small painting of the Seattle skyline with my name written in the sky as stars – that meant a lot to me! i dont think i have a favorite gift..i really love all gifts since it showed the person was thinking of me to buy me a gift. In recent years the next generation has made up family photo calendars – I get to enjoy them every day! The best gift I ever received was a picture album from husband with ideas for a date night each week and a spot for a picture from the date. It was the sweetest, most thoughtful gift ever and I will cherish those memories forever! The best gift I was ever given was a trip to Paris for my 40th birthday. The best gift I ever received was my engagement ring and wedding ring. This may sound corny, but the best gift I have ever received was a handmade card from my son when he was about 6 or 7. It included all the reasons that he loves me in a poem and was so cute. One of my favorite gifts is my Mother’s necklace that I received from my kids. The best gift I’ve ever received is my daughter! When I was a child, I guess my favorite gift was my Weeble Wobble treehouse. The best gift I ever got was a new television. Two years ago my husband totally surprised me with a diamond and emerald tennis bracelet. So pretty. It’s hard to remember – somehow, it’s easier to remember the not so good gifts, like the year I asked for a white sweater (blue eyes, so I was always getting blue things) and got 4 or 5 blue sweaters instead. Had to go buy my own. Or when my parents decided I “wanted” water skis. Spoiler – I didn’t. The one gift that stands out in my memory is the cowgirl outfit I got when I was about 5 or 6 years old. I’d been reading my father’s Hopalong Cassidy books and was just thrilled to have that outfit! Best gift I ever received is a special USB drive. The best gift I ever received was a cross country trip. One of my favorite gifts was a Macbook from my husband! I LOVE all your favorite things too! My Kitchenaid Mixer was probably the best gift I’ve ever received. I use it ALL the time. The year I was gifted a video camera that I used for years to video my two kids on holidays and special occasions. Hmmmm the best gift I ever received is probably this year-I’m getting a little Christmas baby! The first Christmas I spent with my husband’s family I received several jars of spices (cinnamon, parsley, etc). They were reused spice containers that had been refilled and the new spice inside was written over the existing label with a sharpie. Even better – the contents of each jar did not match the label or the name written in sharpie. Sounds like a practical joke, but this was a genuine heartfelt gift from a somewhat crazy aunt. The best gift I ever received would have to be my niece! She was born close to Christmas and made me an Aunt for the first time! Best gift was my engagement in 2000! I commented on The Ultimate BLT Dip Recipe. The best gift I’ve ever received are my dogs … lifelong friends at Christmas and all year round. The KitchenAid mixer I got this past year for my birthday was the best gift I ever received! Best gift was a dog as a kid for the holidays. The best gift was a charm bracelet when I was about 11. It had been my mother’s when she was a child. The best gift I have ever received was my car. I will drive it until the wheels literally fall off. Haha! My husband gets me the illustrated Harry Potters every year and it’s the best thing. Last year, he also got me an Apple Watch, which was the coolest thing ever. The best give I received was a tv for my bedroom. My favorite gift was my camera that I got a couple years ago. The best gift I’ve ever received was a kitchen aid stand mixer from my husband. I had wanted one since we got married, and he surprised me with one on our tenth anniversary! The best Holiday gift I received is my engagement ring tied to the Christmas tree and I became engaged! The best gift I ever received was my new bike. The best gift I ever got was my Reebok Step bench…which has lead me to working out for over 20 years consistently….so I can love my family longer. Almost 62 and still going at it and stronger and fitter than ever. The best gift I have ever received was the year my husband gave me a puppy a few months after we lost our dog, who had been the love of my life! I was so lonely and missed my old friend so much, that I just couldn’t cheer up and I refused to try to replace him until I saw that sweet, furry puppy face and heard his sad story. My husband was right, he was perfect for our family and even though he didn’t replace my old dog, he definitely belongs in our family! The best gift I received was quality time with family. The best gift I ever received was salvation through faith in Jesus Christ. I agree, the best gift I received is Salvation! My favorite gift I’ve received is a bracelet my mom made with with my daughter Aria’s baby photos in it. The best gift I’ve received was Bozo Buckets. The best gifts are the ornaments the kids make and are still on my tree 40 years later. My favorite gift I ever received was a signed picture by the quarterback of my favorite NFL team. The best gift I ever received was from my Husband, he usually can’t keep a gift a secret and I know what I’m getting but one year he gave me a new wedding ring and I had no idea. The best gift I ever received was a new camera to start a photo business! The best gift I ever received was the Bible my mom and dad got me for Christmas one year. My dad even wrote a special little note inside of it for me. Money was very tight one Christmas, and my husband used his time and talent to create a wooden nativity scene that he found in a Christmas edition of a Better Homes and Gardens magazine. I cherish these simple figures and the love that went into their creation. The best I have ever received was my Mother’s ring. My husband bought it for me after we had a family tragedy and it is the perfect style and full of sentimentality to me. The best gift I ever received was my husband. The best gift I ever received was a diamond tennis bracelet from my mom. I received it many moons ago and I still have it to this day. My favorite gift ever received has to be my grandmother’s ring I received after she passed away. I cherish it! One of my favorite gifts I ever got was a ring that I wear often. The best gift I ever received was a Seiko watch from my, now, husband. He gave it to me the first year we started dating and I’m still wearing it 14 years later. The BEST gift I’ve received is a purple push pedal car! It looked like a Corvette and it was so awesome! I rode it in our apartment’s basement, that went all the way around. I was the coolest kid in the neighborhood! The best gift I’ve received was cash! The best gift I ever received was my wedding ring. The best gift I ever received was an engagement ring from my soon to be husband. The best gift I ever received was my second daughter who was born on Christmas night almost 13 years ago. My best gift was an ipad. One of the best gifts I ever got was a Barbie Camper when I was a child. It was my favorite toy. the best gift i ever received was a trip to europe! !